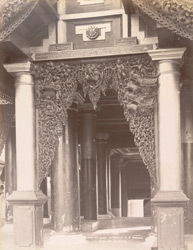 Photograph of the façade of the east entrance to the Shwe Dagon Pagoda at Rangoon (Yangon), taken by Philip Adolphe Klier in the 1890s in Burma (Myanmar). The Burmese have an ancient tradition of woodcarving, at which they excel both technically and aesthetically. Beautifully-carved and ornate wooden elements such as the intricate scrollwork spandrels framed between the columns and the foliated eaves in this view are a characteristic feature of Burmese sacred architecture. The spandrels depict an episode from the legendary foundation story of the Shwe Dagon, Burma's most revered Buddhist shrine. Two Burmese merchant brothers, Tapissa and Bhalika, shown on the right with bullock-drawn carts, were encouraged by a nat spirit to seek out the Buddha in India and found him meditating under a sacred Bo tree. He is shown in the carving seated on the left. They presented him with honey cakes and received his teaching. On their departure, the brothers were given eight hairs from his head which they enshrined as sacred relics on Singuttara Hill where the pagoda now stands. The documented history of the Shwe Dagon dates from the 14th century with Binnya U (ruled 1353–85), ruler of the Mon kingdom of Pegu (Bago), who raised the stupa to a height of 22 ms.
Queen Shinsawbu (ruled 1453–72), built and enlarged the square platform, raised the stupa again and gilded it. In the 17th and 18th centuries it was damaged by earthquakes and repaired. In 1774 the Konbaung king Hsinbyushin (ruled 1763–76) added a new hti (umbrella), thus raising the monument to its present height of 99 ms.